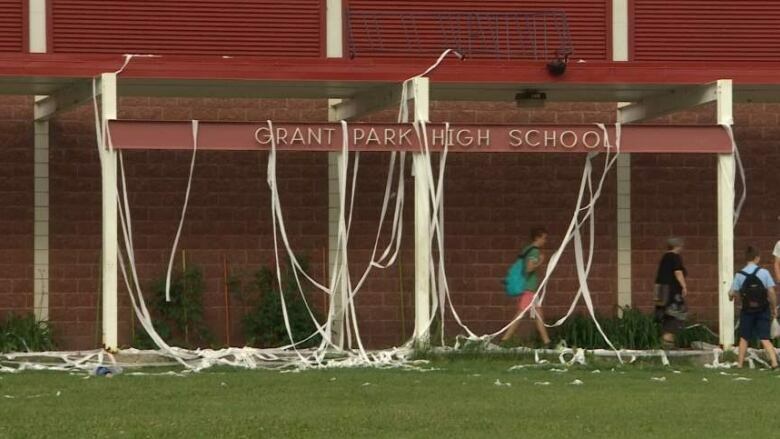 Staff and students at Winnipeg's Grant Park High School arrived Thursday to a two-ply problem. The entrance to the school on Nathaniel Street and some nearby trees were flush with toilet paper. "It was funny to drive up and see that," said principal Susan Anderson, who rolled with the prank. She said the redecorating was part of the annual senior high prank day, which happens at many high schools in the city. Senior students get together and come up with some minor mischief. Often, it happens inside the school, such as the rearranging of classroom furniture, but this time it was a bit more public. "This one was the most visible," said Anderson. "But it's pretty harmless." She, along with other staff, administrators and custodians teamed up to clean up the TP. It didn't take too long, and no one really minded, Anderson said. "It was nice out there."